I am going to visit your show in Dortmund on 9th. 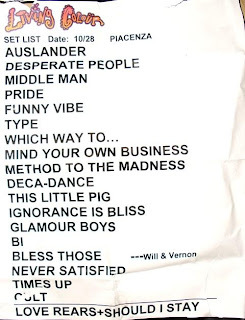 I appreciate the integration of not so often heard songs like Ausländer and mind your own business into the set, but I also wonder why there was no song from Collideoscope on the setlist (neither where there any in Amsterdam)? Anyway, I do love Method to the madness!!! !